What does it mean to be young, gifted and black in 2018? The Internet might have an idea. 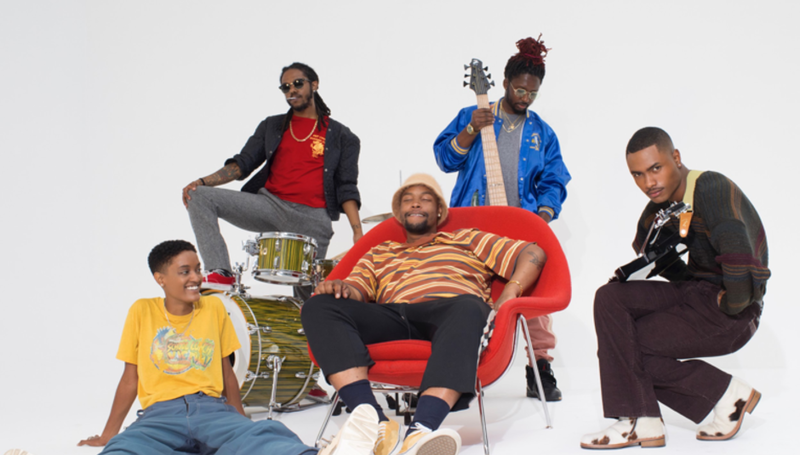 The Los Angeles band are a thoroughly modern project; pro-LGBT, mixed-gender and sustained by a large online following, and their music, a brand of neo-neo-soul, draws from a long history of African-American music. Their latest album, Hive Mind, sees them return with renewed confidence and collective ambition, after a year spent working on solo material. Against a troubling political backdrop, The Internet preach a spirit of togetherness and positivity. Hive Mind’s resistance is more personal than political though, telling tales of love won and lost with a backing of soul and R&B. Classic collectives such as George Clinton’s Parliament-Funkadelic and the loosely-defined Soulquarians of the late Nineties are clear touchstones. The more contemporary sounds of Thundercat, Flying Lotus, and Pharrell Williams also make appearances. While early Internet records felt like solo albums for lead-singer Syd, Hive Mind sees her acting as a band-leader, letting each member express themselves more freely. The greater presence of the group’s other members is clearly felt on the album’s opening four tracks, which rank among The Internet’s finest. ‘Roll (Burbank Funk)’ and ‘La Di Da’ are the record’s best grooves, anchored by Patrick Paige II’s nimble bass playing, and examples of how Hive Mind works best when The Internet give themselves freedom to improvise. Opener ‘Come Together’ is embellished by a jazz flute which wanders quietly in the background, while ‘Come Over’ allows Steve Lacy to roam free with a gracefully simple guitar solo. Unfortunately, after this opening run Hive Mind takes a turn towards less intricate and ultimately less interesting slower numbers. Songs like ‘Bravo’ and ‘Next Time/Humble Pie’ feel particularly held back by repetitive arrangements which appear to aim for a hypnotic atmosphere but end up feeling slightly monotonous. The looseness of the album’s opening songs does return on ‘Beat Goes On’ as a welcome break from the chilled atmosphere. ‘Mood’ also strikes a nice balance between the album’s two main styles, groovy and mellow, with what sounds like a subtle nod to Aaliyah’s ‘More Than a Woman’ in its middle breakdown. The album’s restrained second half shows that the flaws of early Internet albums are not completely gone. Syd is still a fairly undynamic vocalist and on the album’s softer songs, her voice tends to drift into the background. Lyrically, she is also not as bold as the music around her. Similarly, while The Internet show ample skill with crafting grooves, some of the song-writing on Hive Mind feels unstructured and much of its second half blends indistinctly together. However, while Hive Mind does not solve all the problems with The Internet’s sound, it does make the most compelling case yet for the band as a group rather than a collection of individual personalities. The highlights are also plentiful on this record. The singles are by far The Internet’s best and other moments, such as the killer groove on ‘Look What U Started’, are worthy of their influences. Hive Mind is at its best when it gives its band-members a chance to loosen up. A more expansive record, with longer, more experimental songs, may be the best way forward. Nevertheless, this record makes a good argument for The Internet’s best work being together. The group do not always connect perfectly on this album but when they do, it’s magical. Hive Mind celebrates musical collectivism and succeeds when it is at its most collaborative.